The Trumpet keeps a watchful eye on Vladimir Putin and his grip on Russian power because of what Bible prophecy says on the topic. Around a.d. 90, the Apostle John was inspired to write a striking prophecy: “And the number of the army of the horsemen were two hundred thousand thousand: and I heard the number of them” (Revelation 9:16). That is discussing a military force of 200 million soldiers, which is more people than were even alive on Earth at the time that it was written. Bible passages give several important details about this largest armed force ever amassed on Earth. Revelation 16:12 designates the bloc as “the kings of the east,” showing it to be a group of Asian countries. A prophecy in Ezekiel 38 provides still more information: “And there is a word of [the Lord] unto me, saying, ‘Son of man, set thy face unto Gog, of the land of Magog, prince of Rosh, Meshech, and Tubal, and prophesy concerning him” (verses 1-2; Young’s Literal Translation). Meshech and Tubal are ancient names designating modern Russian cities. And Rosh is a variation of an ancient name for Russia, once called Rus. Many encyclopedias and commentaries, such as the Jamieson, Fausset and Brown Commentary, recognize this. The chapter discusses the exploits of the forces led by this “prince of Rosh, Meshech, and Tubal,” and also discusses the eventual defeat of this mighty power. So who is this powerful Russian “prince”? I strongly believe Vladimir Putin is going to lead the 200 million-man army. Just look at the power he already has. Can you think of any other Russian politician who could become so powerful and have the will to lead Russia into the crisis of crises? I see nobody else on the horizon who could do that. And only a tiny few years remain for the prince of Rosh to appear! … This much is absolutely certain: The restoring of Russia’s power by Vladimir Putin—the prince of Russia—was prophesied! He has already solidly allied Russia with China. The prophecy about the prince of Russia includes that main alliance. While Ezekiel 38 is an endtime prophecy, it is not to be fulfilled until well after Jesus returns. To suggest that Vladimir Putin has actually fulfilled parts of the Prince of Rosh prophecy in Ezekiel 38 is wrong. It is easy to prove that Ezekiel is an endtime book. Ezekiel 38 is clearly an end-time prophecy. Verse 8 specifically mentions its setting in the “latter years”; verse 16 talks about the “latter days”— such statements are made throughout Ezekiel’s book. Can you think of a politician who could fulfill the role of the prince of Russia? One, and only one, comes to mind: Vladimir Putin. The book of Joel describes an army called God’s army (Joel 2:11, 25). The context shows that this is the same army headed by the “prince of Rosh.” That means that even though God commands His servant to prophesy against him, God is actually using this “prince of Rosh” for His own purpose. 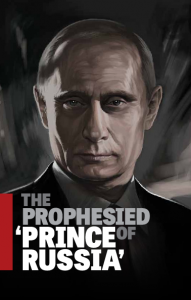 The return of Jesus is inspiring, and because of his role in the world, Vladimir Putin has and probably will take more steps that will align with biblical prophecy, but the idea that Vladimir Putin is the “prince of Rosh” of Ezekiel 38 is simply not true. While the “latter days” is a prophetic term, Ezekiel 38 is talking about a time well after Jesus has returned. But Gerald Flurry is teaching that many verses in Ezekiel 38 happen before Jesus returns–this is in error. Does Ezekiel 38 and 39 Refer to Russia? Despite claims from Gerald Flurry, it is not the case that Ezekiel 38:1-7 is fulfilled prior to the return of Jesus. Certainly, there will be a 200 million man army, but that is not what Ezekiel 38:1-7 is talking about. 1 Now the word of the Lord came to me, saying, 2 “Son of man, set your face against Gog, of the land of Magog, the prince of Rosh, Meshech, and Tubal, and prophesy against him, 3 and say, ‘Thus says the Lord God: “Behold, I am against you, O Gog, the prince of Rosh, Meshech, and Tubal. 4 I will turn you around, put hooks into your jaws, and lead you out, with all your army, horses, and horsemen, all splendidly clothed, a great company with bucklers and shields, all of them handling swords. 5 Persia, Ethiopia, and Libya are with them, all of them with shield and helmet; 6 Gomer and all its troops; the house of Togarmah from the far north and all its troops — many people are with you. Verses 1-7 talk about a group getting ready to battle. Vladmir Putin has not fulfilled this. Pay close attention to verses 7-13. It is against a ‘peaceful people’ in unarmed villages that the prince of Rosh is going against. This cannot happen until AFTER the return of Jesus. Hence this is not possibly a prophecy about Vladimir Putin. So, a power from the far north, which would seem to have to be Russian-led as it is the only major military power in the far north now, and may be the only one also in the future, will come. Yet, notice that this happens when Israel is “dwelling safely.” While Ezekiel 38 does mention Russia and Iran, the tiny nation of Israel is NOT now a “land of unwalled villages” with “a peaceful people who dwell safely” as other verses in Ezekiel 38 point out (see Ezekiel 38:10-11). Can anyone seriously believe that Israel is a nation of peaceful people dwelling safely? It has walls and many enemies. Despite what Gerald Flurry and certain others believe, we are not particularly close to the fulfillment of Ezekiel 38. Those who believe otherwise are in error. The restoring of Russia’s power by Vladimir Putin—the prince of Russia—was prophesied! He has already solidly allied Russia with China. The prophecy about the prince of Russia includes that main alliance. Other nations are leaning toward an alliance with Russia. Several of them are prophesied to join. The only question is whether or not Putin personally finishes the entire prophecy. The change in the translation in Ezekiel 38:2 was done in disbelief that a prophecy in Ezekiel’s time could so obviously and clearly name a nation, its people, rivers and major cities, a thousand years before it was formed! But the meaning of this prophecy and the identity of the people contained in it is not hidden to those who will believe what the Bible says. Mr. Armstrong simply believed what was revealed in the Bible, and that is why he could so boldly predict that Russia would not attack America! The Trumpet follows in the tradition of Mr. Armstrong. By believing what the Bible has to say, this magazine makes strong forecasts concerning the major world powers that have proven accurate and will continue to be proven true. What does Ezekiel 38 say will happen to the Russian people? “Son of man, set thy face against Gog, the land of Magog, the chief prince of Meshech and Tubal, and prophesy against him” (verse 2). This prophecy for the Russians and Chinese will occur after the great and terrible events that lead to Jesus Christ’s return—events recorded in the book of Revelation. Revelation 9:1-12 describe a European beast power, after occupying Jerusalem and enslaving the end-time nations of Israel, preemptively attacking Russia and China out of fear. Then Russia, China and other Eastern powers, collectively called “the kings of the east,” amass a 200 million-man army and counterstrike the European army. This clash kills one third of mankind! (verses 13-21). Then what is left of these armies will gather in Armageddon to challenge and attack Christ in Jerusalem upon His return! Christ will utterly destroy these armies and begin His reign by gathering the scattered descendants of Israel around Jerusalem. What is in store for Russia in the meantime? Nearly 60 years later, will Mr. Armstrong’s prediction continue to be proven true? Today, the world is in an even worse condition than when Mr. Armstrong printed that headline. The threat of nuclear war is even higher than in the peak of the Cold War. Several rogue states have acquired or are acquiring the means to wipe whole nations off the map. America’s global dominance is again being challenged, not just by one nation but by many different major powers. Major powers all over the world such as China, the European Union and Iran are increasing their military capabilities, while a debt-burdened U.S. is shrinking its own. I bolded the paragraph above as it clearly contradicts what Gerald Flurry (self-appointed and false prophet of PCG) now teaches. PCG used to teach that Ezekiel 38 was fulfilled AFTER Jesus’ return, yet now it teaches that it is fulfilled BEFORE Jesus returns. Furthermore, notice PCG had the audacity to state that this explanation of Ezekiel 38, which they have since contradicted, was an example of why their forecasts were supposedly right. PCG’s forecasts are not always accurate. They are often wrong, and those who rely on them above the Bible will not possibly know when the Great Tribulation will begin. Sadly, in that respect, PCG is not the only claimed COG that will not know–a list of dozens of errors in prophetic understanding that various ones who claim to be COG is in the article The Laodicean Church Era. As far as Donald Trump and Russia goes, I suspect that Donald Trump would like cooperation with Russia, but is willing to go against Russia when he feels he needs to. Irrespective of what the Trump Administration does or does not do, Vladimir Putin is NOT the prophesied ‘prince of Rosh’ of Ezekiel 38. Let me state that Gerald Flurry did NOT base his position that Vladimir Putin would be the prince of Rosh of Ezekiel 38 from the Bible. He claimed to get some type of message from a supernatural source (see Teachings Unique to the Philadelphia Church of God). And that source was NOT God’s Holy Spirit. While it could be possible that Vladimir Putin would lead the 200 million man army, it should be pointed out that the earliest that Revelation 9:16 could be fulfilled is7 or 8 years from now. But as far as being the ‘Prince of Rosh,’ that prophecy cannot possibly be fulfilled by Vladimir Putin. The New World Order Is Leaving the US Behind Bloomberg reported that the New World Order is leaving the USA behind. Other secular news sources are also reporting the rise of a new world order and decline of the influence of the USA. What about NAFTA, the Paris Accords, TPP, TWO, and NATO? Russia, China, and Europe are all working towards reducing dominance of the USA. Is this consistent with biblical prophecy? When did the time of Anglo-American dominance begin? Will the coming world order be dominated by a European Babylonian power? What will happen to the USA, United Kingdom, Australia, and New Zealand after military actions by the coming order and the Great Tribulation? Are there any ties to Armageddon? Dr. Thiel addresses and more from the Bible. Spiritual Samaritans: Old and New Who were the Samaritans? Do the represent true Christianity or something else? Here is a link to a related sermon: USA in Prophecy: Samaria.Who is the King of the North? Is there one? Do biblical and Roman Catholic prophecies for the Great Monarch point to the same leader? Should he be followed? Who will be the King of the North discussed in Daniel 11? Is a nuclear attack prophesied to happen to the English-speaking peoples of the United States, Great Britain, Canada, Australia, and New Zealand? When do the 1335 days, 1290 days, and 1260 days (the time, times, and half a time) of Daniel 12 begin? When does the Bible show that economic collapse will affect the United States? In the Spanish language check out ¿Quién es el Rey del Norte? Here is a link to a video titled: The Future King of the North. This entry was posted on Tuesday, January 1st, 2019 at 8:30 am	and is filed under COG News, Prophecy.